Was Daniel 12:2 Fulfilled in the resurrection of Matthew 27:51f? The answer is undeniably- NO! 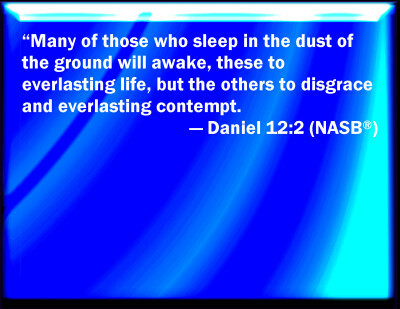 And many of those who sleep in the dust of the earth shall awake, Some to everlasting life, Some to shame and everlasting contempt. (Daniel 12:2). Be sure to read the first article in this series. I have been asked on numerous occasions to comment on the (supposed) correlation between Daniel 12 and Matthew 27. 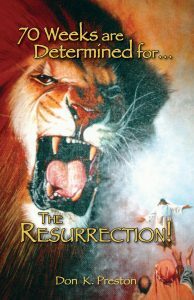 I have been asked recently to specifically address the question of whether Daniel’s prediction of the resurrection (12:2) was fulfilled in the awesome events recorded in Matthew 27. There are some who believe that the resurrection of the saints in Matthew was in fact the direct fulfillment of Daniel’s prophecy. I do not, and will offer a few reasons in a brief series of articles, as to why I reject that suggestion. In the first installment we noted that the resurrection of Daniel 12:2 is inextricably linked to the Great Tribulation of v. 1. There is no contextual way to dichotomize these two events into two separate times. The resurrection would come at the climax of the Tribulation. Or, at the very least, at the time of the Tribulation. It is simply incredible that some, e.g. Sam Frost, now claims that verse 1 was fulfilled in the time of Antiochus Epiphanes, but that verse 2 is at the end of human history. That demands that there is a gap of, so far, 2500 years in the period at the end of verse 1! The fact is, as I pointed out in the first article, there is a consistent pattern of connection between the Great Tribulation and the Resurrection in the Tanakh. Brant Pitre in his Jesus, the Tribulation and the End of Exile, provides a summary view of Jewish eschatological views, taken from the Tanakh. In his dissertation, comes up with a set of principles commonly found from studying Hebrew Second Temple literature (up to 30 AD) in regard to how the Jews viewed the Tribulation, up to Jesus’s time. 3. There will be a righteous Sufferer (individual); and the righteous collectively suffer and/or die during the Tribulation period. 4. The Tribulation is tied to the coming of the Messiah, sometimes referred to as the Son of Man. 7. The Tribulation has two stages: a preliminary stage and then a later greater tribulation. 8. The Tribulation precedes the coming of the eschatological kingdom. 9. An eschatological tyrant opponent or some anti-Messiah arises during the tribulation. 10. Typological images from the Old Testament are used to depict the tribulation (symbology, imagery). 11. The tribulation is tied to the ingathering and/or the conversion of the Gentiles. 12. The tribulation has some kind of an atoning or a redemptive function. 13. The Jerusalem temple is defiled and/or destroyed during the Tribulation. 14. The tribulation precedes the resurrection of the dead and a new creation. (Brant Pitre, Jesus, Tribulation and the End of Exile, (Grand Rapids; Baker Academic, 2005), 187). Remember that Jesus posited the appearance of the Abomination of Desolation prior to the Great Tribulation. Thus, to suggest that the resurrection of Matthew 27 fulfilled Daniel demands that the Abomination of Desolation had to have already been set up, and that the resulting Tribulation was in full swing. Now, since the Great Tribulation was not in process at the time of Matthew 27:52 this serves as prima facie demonstration that the resurrection of Matthew 27 was not the fulfillment of Daniel’s prediction. Notice now Daniel 12:3. Clearly, verse 3 is tied to verse two thematically as well as contextually. What happens in verse 3? It is the arrival of the kingdom, per Jesus’ interpretation and application of verse 3. So, the resurrection of verse 2 leads to the righteous shining forth. Notice now Jesus’ application of Daniel’s prophecy. In Jesus’ famous parable of the wheat and tares, Jesus gave his interpretation of the parable, as well as lending his comment on Daniel 12: 41-43: “The Son of Man will send out His angels, and they will gather out of His kingdom all things that offend, and those who practice lawlessness, and will cast them into the furnace of fire. There will be wailing and gnashing of teeth. Then the righteous will shine forth as the sun in the kingdom of their Father. Take note that Jesus directly cites Daniel 12:3 in v. 43. And, he said that Daniel would be fulfilled at the coming of the Son of Man, at the end of the age, the time of the harvest. Without doubt, the harvest at the coming of the Lord at the end of the age is the time of the resurrection of Daniel 12:2. The harvest of Matthew 13:41-43 is the resurrection age of Daniel 12:2. But, the harvest of Matthew 13:41-43 occurs at the coming of the Lord at the end of the age (Matthew 13:41-43). Therefore, the resurrection of Daniel 12:2 occurs at the coming of the Lord at the end of the age. It should be observed that John the Baptizer spoke of the harvest as being imminent – at the time of the judgment – in Matthew 3:7-12: “his winnowing fork is already in his hand,” “the axe is already at the root.” Harvest and judgment go hand in hand. Harvest and resurrection – thus, Daniel 12:2 – go hand in hand. Harvest and Christ’s coming go hand in hand. Matthew 27 was not the time of the judgment. It was not the time of Christ’s coming. Thus, Matthew 27 was not the fulfillment of Daniel 12. Jesus said that at the time of the harvest the kingdom would be present and the righteous would shine in the kingdom. Did the kingdom arrive in Matthew 27:52? Did those who were raised in Matthew 27 begin to shine in the kingdom? If so, how? Again, per Jesus, that kingdom would arrive in power and great glory – and judgment – at his parousia (Matthew 16:27-28; 25:31f). Patently, the events of Matthew 27:52 did not occur at the coming of the Lord with the angels at the end of the age. Those who claim that Daniel 12 foretold the events of Matthew 27 must provide some powerful, substantive, contextual evidence to show that Daniel 12:2 can be cut out and divorced from verse 1 and verse 3 temporally. There is simply no contextual support for doing so, and when we accept Jesus’ application of Daniel 12:2 to his parousia at the harvest, this falsifies any application of Daniel 12:2 to Matthew 27. For more on the resurrection– and the correlation between Daniel 12 and Matthew 13– see my book Seventy Weeks Are Determined…For the Resurrection.